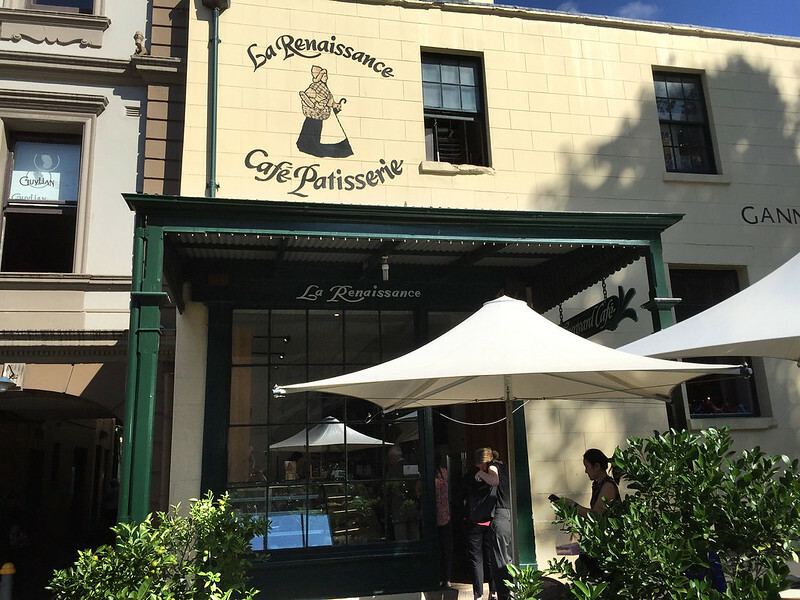 I’ve reviewed La Renaissance before, testing out their pork and veal sausage roll. But that’s not all they have on their menu, by a long shot. So it was natural that I should return to sample other wares of relevance to this blog. 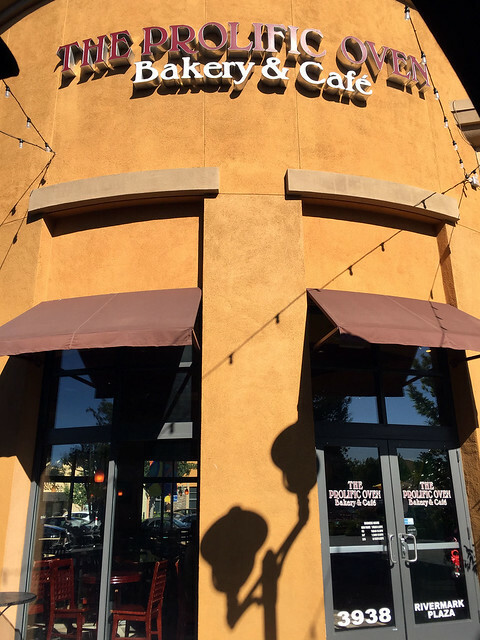 Checking the shop’s history on their website, I find that this patisserie began in 1974, when a French pastry chef opened a shop in Roseville. The business subsequently moved to The Rocks in 1994, sited in an historical building built in 1842 (by an ex-Irish highway robber! ), where it has been ever since. With this venerable history behind it, one would hope that the products have stood the test of time with their quality. On this fine day, I sat in, and ordered the second type of sausage roll from the hot food menu, a pork, bacon, and fennel roll. And to follow, of course, one of the vanilla slices. The items are plated for me by a woman serving from behind a tall display counter, and I take them to a small cafe table in the flagstoned courtyard that extends out the back of the shop. A sunny late autumn morning is perfect for a morning tea, and for exploring new bakeries. We took a drive over to Coogee and continued south to the Bakehouse South Coogee, which sits on a traditional corner store site surrounded by residential properties, and right across the street form the sprawling old Randwick Cemetery, which is situated on a gentle hillside with wonderful views. The bakehouse is busy, with plenty of locals popping in for a coffee and a croissant or something a bit more substantial. Besides bread and pasties, the bakers do an impressive line in cakes, with a couple of dozen mouth-watering varieties all on display. One is an amazing looking multi-colour iced rainbow cake, which is also available by the slice, sitting right next to the huge vanilla slices. If you’re reviewing sausage rolls in Sydney, there is one place you need to go to sample the ultimate example of the sausage roll elevated to an art form. 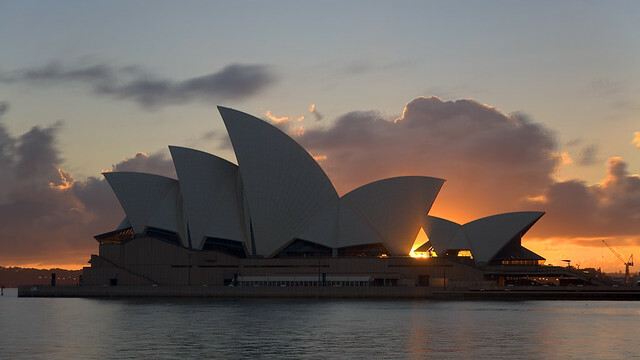 That place is The Bennelong, Sydney’s most iconic restaurant space, enjoying spectacular harbour views from within the miniature set of pearly white shells at the southern end of the Sydney Opera House. This is not just a place you rock up to on a Saturday at lunch time and grab a roll and a snot block in a brown paper bag. This requires planning, finesse, and a willingness to pay for the experience. On an evening when Mrs Snot Block & Roll had decreed that we should attend the Australian Ballet, we had an excuse to make a booking at this prestigious restaurant for a before-show meal. When chef Peter Gilmore, famously of the outstanding Quay restaurant (listed as one of Restaurant magazine’s 50 best restaurants in the world since 2009), took over running The Bennelong in 2015, he decided to split the food experience into a formal dining area and a more casual seating area by one of the bars. This casual area is known as “Cured & Cultured”, and has an emphasis on fresh “produce-focused” dishes, served raw or cold, though there are a few hot cooked dishes on the menu. All of the plates are designed for tapas-like sharing. And one of these sharing plates is the “suckling pig sausage roll with black garlic sauce”, which comes in at a hefty $24. 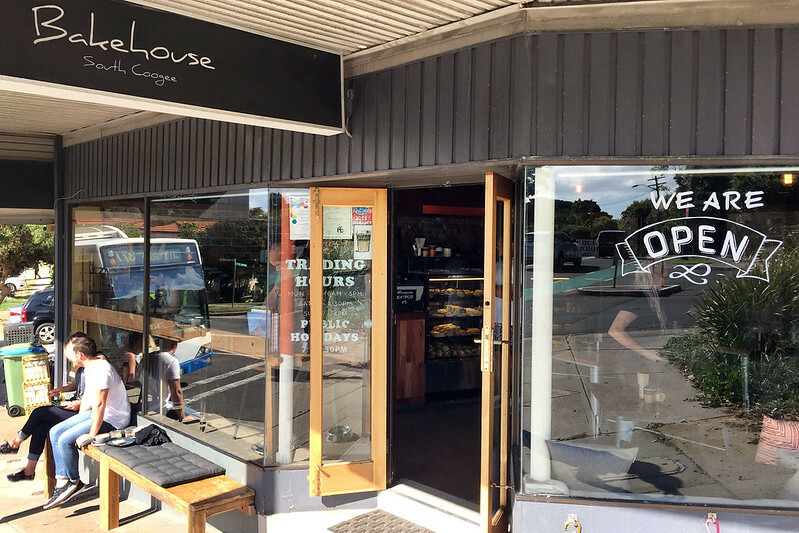 On a leisurely weekend drive to the beach suburb of Dee Why, we popped into Oaks Patisserie for an afternoon snack and cuppa. 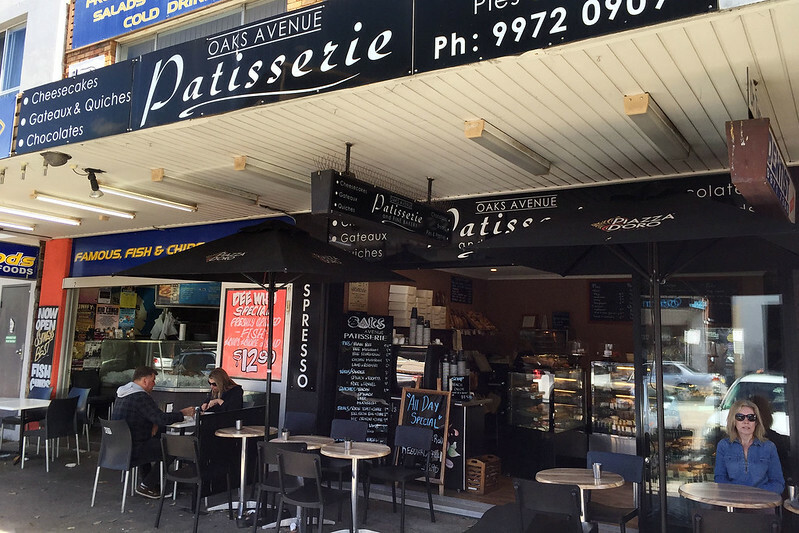 This is a small bakery on a somewhat dingy old retail strip just around the corner from the busy Pittwater Road, so the ambience is not great. Inside, however, is a mouth-watering array of cakes and pastries, which look colourful and artfully assembled. I ordered a sausage roll and vanilla slice and they were delivered by staff to one of the two outside tables for us to contemplate. The sausage roll looks promising enough at first sight, with golden flaky pastry and ever so slightly burnt bits on the ends. However, on the first bite a different experience is revealed. The pastry is a little on the dry side, not greasy or buttery at all. The pastry case has pulled away from the meat filling, leaving a hollow space in between, but pastry is actually middling to okay. 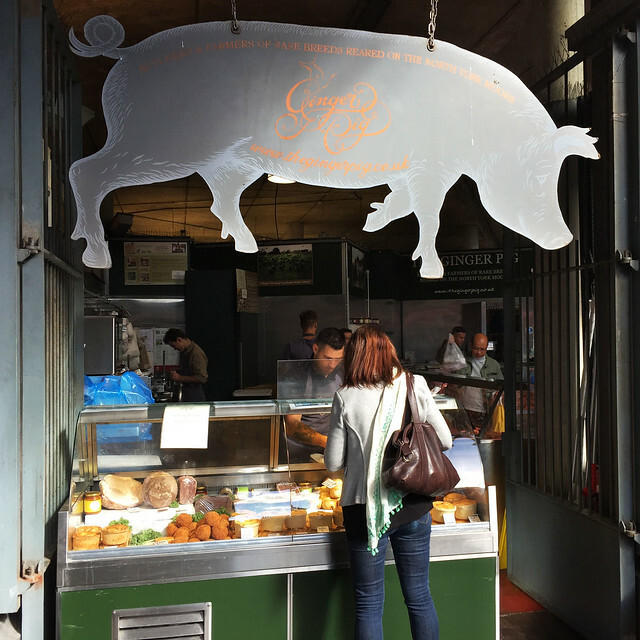 While searching for a small sweet treat to round off a lunch of two sausage rolls, plus a beef and stilton pie which I found at another stall in London’s Borough Market, I happened across the stall belonging to Ginger Pig. This was a butcher, selling all manner of cuts of pork and pork products such as sausages, black puddings, and pork pies. But besides this meat designed to take home and cook or eat later, they also had sitting on the counter a tray containing a glowing golden treasure: four large, plump, delicious looking sausage rolls. Drawn inevitably to this promise of culinary wonder, I saw that they had a warming oven behind the counter, and several enormous sausage rolls therein. A sign proclaimed that they came in two varieties: pork, and pork and stilton! Unfortunately, I was almost full already, and was thrown into a horrible quandary: to sample one of these delectable looking rolls, or to skip them and seek a thin slice of cake or tart. Because these rolls were not merely plump, they were truly fat. Big and chunky. Compared to the previous rolls from Northfield Farm and Boston Sausage, which cost £1.50 and £1 respectively, these cost £4 each – but they looked worth it, they were so big. 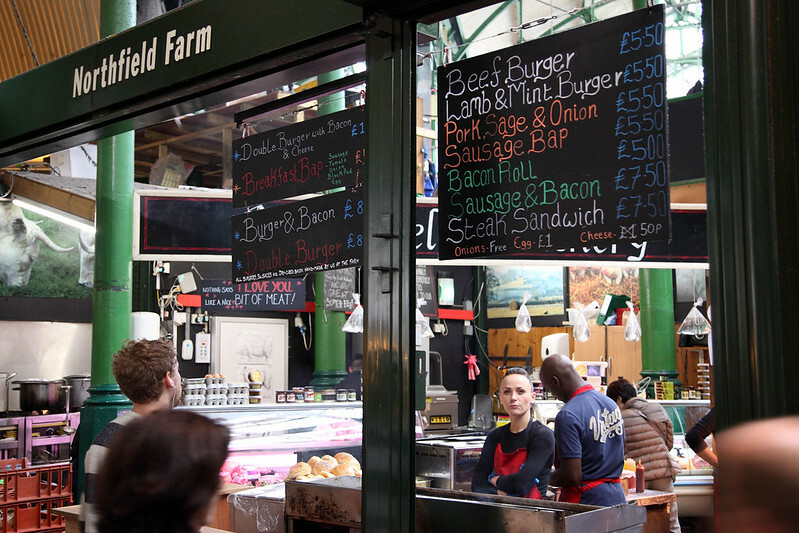 After the slightly disappointing sausage roll from Northfield Farm’s stall in London’s Borough Market, I continued wandering around, looking for more interesting things to sample. In a far corner of the market, right next to Southwark Cathedral, is a row of hot food stalls, preparing lunch treats for passersby. Amongst the grilled cheese sandwiches, kebabs, and enormous dishes of paella, was a place named Boston Sausage. 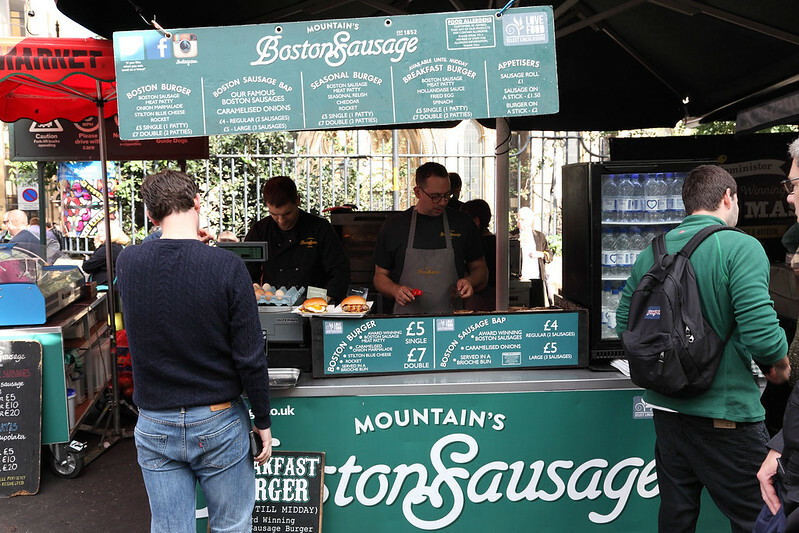 They did a line in sausages on bread rolls, and burgers. But also on the menu, under the heading “Appetisers”, was the golden item: sausage rolls. And only £1 each, so I assumed they must be fairly small. I went over and asked for one, but the guy told me that they were just putting a batch into the oven, and they’d take about 15 minutes. I said I’d return and went for a bit more of a wander through the bustling market. 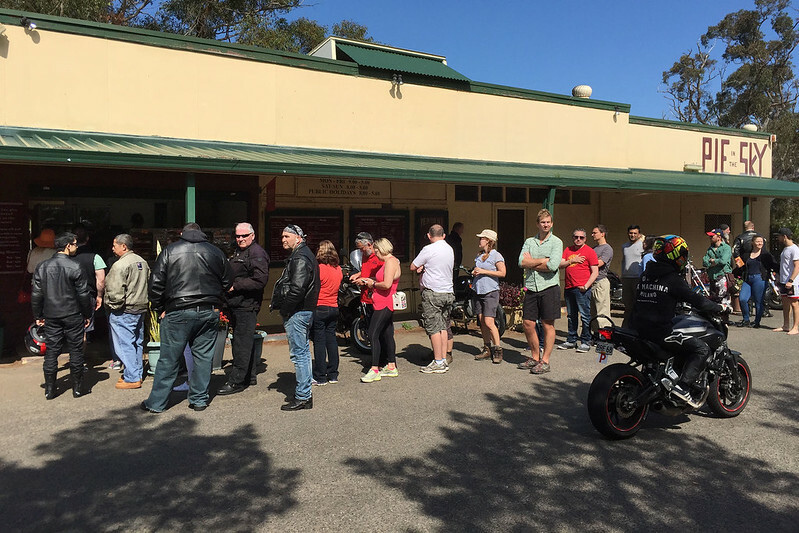 After about 15 minutes I returned, to the loud spruiking voice of one of the staff proclaiming, “Hot sausage rolls! Come and get ’em! Best sausage rolls in the universe! Better than my mum makes!” There was a metal tray piled with the rolls hot out of the oven, and they were going quickly as people were attracted to the yelling and the delicious smells of the stall. On a business trip to London, I was staying in the Chiswick area for a few days. 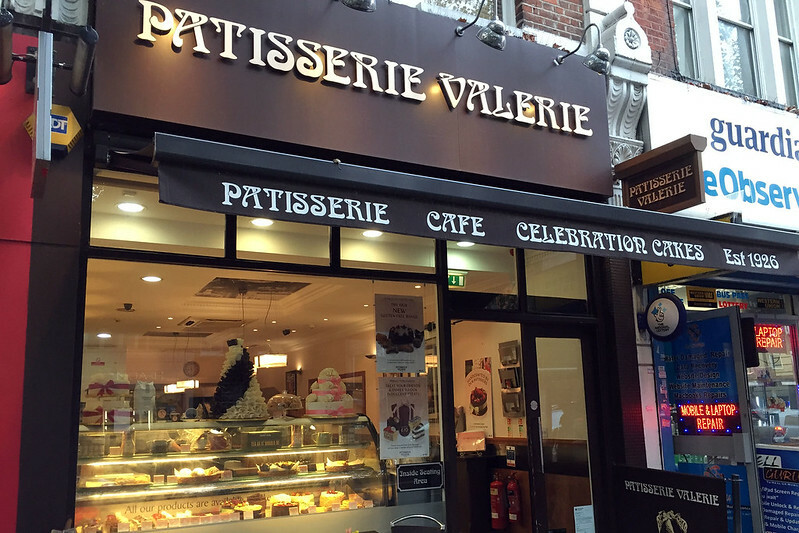 My explorations of the Chiswick High Street on foot uncovered the delicious looking Valerie Patisserie, which enticed with a window display full of luscious cakes and pastries, crowned by a huge piece of decorative frilliness rendered in dark and white chocolate. Amongst the mouth-watering cakes and slices in the window was a neat row of milles-feuilles, looking for all the world like classic Aussie vanilla slices, complete with the traditional drawn brown icing lines on a top of white icing. I discovered this early in the day, on a post-breakfast walk before a day full of business meetings, and had already bought a more robust scone from a nearby bakery to serve as morning tea. So I filed the shop away in memory, to return that evening after the work had been completed for the day and buy one of the slices to take back to my hotel after dinner for dessert. The price was £2.95, and for that the lady behind the counter, rather than tossing it in a brown paper bag as would happen back home, placed it in a neat cardboard box emblazoned with the logo of the patisserie, using no less than three logo stickers to seal the box. This was then carefully lowered into a paper carry bag with handles, again decorated with the shop’s logo.